Alice Henderson never thought she could play professional cricket. Now, she might just get her chance. 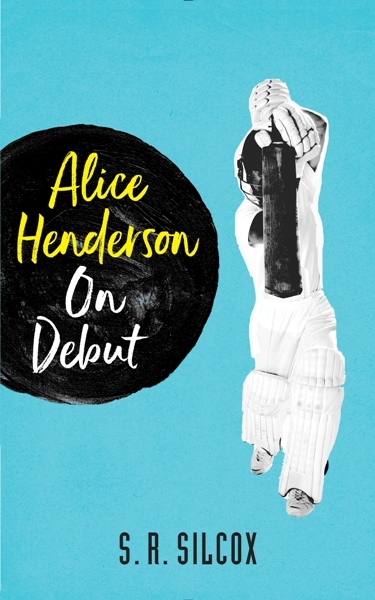 Alice Henderson On Debut is the first book in a new series about a girl who dreams big and wants to one day play professional cricket. 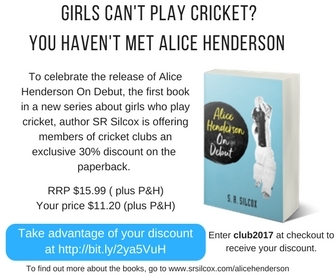 Join Alice as she takes on her first big test, an all-girls, elite cricket camp, where she competes with other cricketers for a chance to play in front of top coaches that could give Alice the chance at stardom. 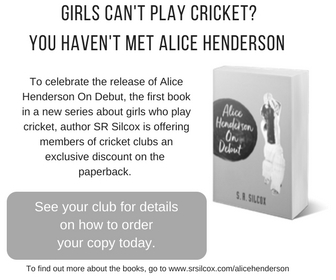 Author SR Silcox is a cricket tragic who was brought up on long hot summers watching the Aussies get belted by the Windies and playing backyard cricket with her friends and family in the holidays. Sadly, she never got the chance to play professionally. She’s living vicariously through Alice’s adventures in an attempt to recapture her childhood dream – to be the captain of the Australian cricket team. To celebrate the launch of Alice Henderson On Debut, SR Silcox is giving cricket clubs and their members an exlusive 30% discount on signed copies of the paperback book. Normally retailing for $15.99, that means you’ll pay $11.20 per copy (plus P&H). Below you’ll find downloadable flyers and ads to include in your newsletters. Make sure you include your discount code club2017 so your members can receive their discount. Where can our club, or our club members order the book from? (Important: for clubs wanting to order in bulk to resell to their members, please email me at orders@srsilcox.com with your request). Will my club still get the discount if I want to buy a bulk order for my club to sell or give away to our members? Yes you will. For bulk orders, please email me at orders@srsilcox.com. If my club orders in bulk at the discount rate, can we sell them for more than what we pay? Of course! If you want to purchase a bulk order for your club, and on-sell the books for, say $13 each (still a discount of $3 from retail for your members) and put that profit towards your club, you’re welcome to do so. Are you available to sign the books? I will sign each book ordered individually by members (if you choose not to bulk order and allow your members to order themselves). If you’d like to organise a date for me to call in to your club or association grounds to sign books, I’m happy to accommodate if I can. Please email me at selena@srsilcox.com to discuss available dates and times. The books generally take 5-10 days to arrive. If making a bulk order, the books will usually be shipped directly to your club. If you want each book signed before shipping, delivery will take slightly longer as they will need to be shipped twice. If you have any further questions, please don’t hesitate to ask. You can email me at selena@srsilcox.com. These come in both PDF and JPG format. PDFs are A4 size, print-ready in both colour and b&w. Use these if you print your newsletters or to hang on the club noticeboard. JPG Copies come in colour and b&w. Download to insert into newsletters. Bulk Order Flyers – Use these if you intend on ordering in bulk and reselling for profit as a fundraiser. There is a space at the bottom of the flyer to add in your own contact information as well as the price you’re reselling at. Individual Order Flyers – Use these if want your club members to order the books themselves. Newsletter Inserts – Use these jpgs to insert into newsletters (right click and ‘save as’).